Welcome to Crawford, Nebraska! The Garden Beyond the Sandhills. Whether in Crawford for business, recreation or raising a family, Crawford truly is a garden of opportunity! 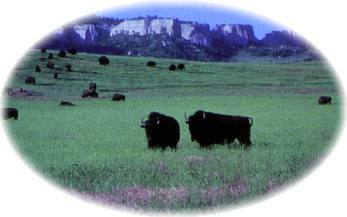 Located in the scenic Pine Ridge of Northwest Nebraska, it is just three miles east of Fort Robinson State Park and 50 miles south of the Black Hills of South Dakota. U.S. Highway 20 and State Highway 71-2 intersect at Crawford. Crawford was established in 1886 as the Fremont Elkhorn Railroad pushed west. Located at the edge of a military post, Crawford was rough and rowdy in its early days. Tales of "shoot outs" and revelry fill the towns early history. An enterprising city editor obtained signatures from fort soldiers so he would have the number needed to file for the incorporation for the town. Named for a soldier stationed at the fort who was killed in Mexico about the time the town was organized, many streets in Crawford also carry the names of soldiers. Now a peaceful city, Crawford is home to more than 1,150 people. Fort Robinson, whose existence has greatly influenced the history of Crawford, served the West for more than 70 years. Its activities include the breeding and training of horses for the army and later for the Olympic equestrian teams. Many horses and mules were shipped overseas to Italy, Burma and other locations. During World War II, it expanded to train dogs for wartime duty. Fort Robinson was also one of 20 prisoner of war camps located in Nebraska. The prisoners worked on farms in the area, taking the places of the young men who had gone to the service. Deactivated in 1948, Fort Robinson is now a state park, with many buildings restored as a part of the State Historical Society's out-state museum system. Tourism plays a sizable part of the local economy. Known as "The Little Badlands of Nebraska," it is a popular rock and fossil hunting area. The Northwest Nebraska Rock Club of Crawford hosts yearly shows in August. Crawford's annual rodeo was started in 1945 as a fund raiser to build the Crawford Hospital. In 1949 the date was moved to July 3rd and 4th. The rodeo became a Professional Rodeo Cowboys Association (PRCA) event early in its history and since 1979 the purses have been raised to attract nationally known contestants. Starting with Fort Robinson's centennial in 1974, the Western Art Show is also held during this event and a big parade on the morning of the Fourth. Lover's Leap Vineyard, one of only three wineries located in the state, is located in Crawford! From about 1857 to 1876, an Indian "trading post" occupied a site near here. Built by James Bordeaux, the trading station was often attacked and set afire by hostile Crow warriors. Fortunately some friendly Sioux Indians came to the rescue and drove off the attacking Crow. The museum is dedicated to preserving the rich history of the North American fur trade and is located three miles east of Chadron, Nebraska, on U. S. Highway 20.